Back before he turned The Avengers into a big-screen success, Joss Whedon was a guy I hoped would take a run as writer of The New Teen Titans. Starfire's alien heritage, Raven's relationship with Trigon and Deathstroke the Terminator would all benefit from the pen behind Serenity and Twilight/True Blood kickstarter Buffy Vampire Slayer. While Joss has the writing chops, as with anything Teen Titans, there's few I'd pick to draw the heroes over George Perez. An artist who has even drawn this throw-down of the team clashing with another of his career defining projects, those Avengers I was talking about earlier. 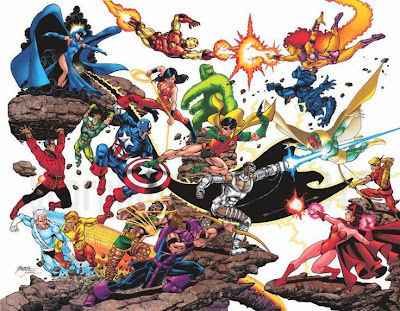 I know, suddenly Avengers/JLA just seems a consolation prize. Everytime I look at this drawing, match-ups I'd never thought about become slugfests I'm dying to see. Beast vs Beast Boy, Hercules vs Donna Troy, Quicksilver vs Kid Flash... I literally get lost in thought. Hopefully after his recent eye surgery has healed, George gets to continue putting out stellar work for BOOM! Studios in 2014. Still, there will always be one ear of mine to the ground waiting for word a contract exception that has been made for an old continuity team up of two great eras. Brilliant pic- whered it come from, make a great phone pic. It looks like one of those mash-up pics Wizard magazine used to do. Yes a Titans/Avengers fight would be good. I got that Titans hardcover 'Games' he did last year and it was such an incredible read. I hope after his recent health troubles George is doing okay, and his eyesight hasn't been too badly affected. George himself actually Tweeted it earlier this year Karl, and I've had it on file since then. Brian Michael Bendis has also posted about it on his Tweet list, so it's definitely scored high points across the board. It's a fan commission to, so probably nestled above some lucky person's fireplace at the moment. Thanks for reposting the pic - I didn't know that Perez had an eye operation. At this point, any NTT project would be a dream project, with the way the Didioverse is going. Hey TB! Yes and for an artist that's even more of a massive surgery than normal. Still on the road to recovery already. As for the New Teen TItans, yes, like Karl was saying above, I think it's good timing that Games was recently released. That way the lightning in a bottle of the era can still feel new again. @karl, it's funny you should say that because I already have it on my phone. It recently got replaced by an beautiful Bride of Frankenstein for Halloween, but it'll go back up afterwards. Everyone else that does Titans, no matter how good, feels second best. I'm sure that's not fair, but it's a testament to how iconic Perez made them to everyone. One look at a Perez Titan and you know exactly where you are. Home. Under the covers. With a flashlight.